Symantec’s recently released Backup Exec 15 delivers powerful, flexible and easy-to-use back up and recovery for enterprises. With the growing reliance on data, back up and recovery is becoming a top priority for organizations of all sizes. But with all the different platforms and configurations, complexity augments. Finding the ideal back up and recovery solution for your enterprise can be a bit confusing and challenging. It doesn’t need to be that difficult. Symantec recently announced the launch of Symantec Backup Exec 15 – an easy to use solution that delivers powerful and flexible backup and recovery designed for your entire infrastructure regardless of platform: virtual, physical or cloud. With Backup Exec you get fast, reliable backup and recovery of data and systems at every level and advanced integration with the most recent releases of VMware, VSphere and Hyper-V. Simply put, you can recover – in a matter of minutes – VMs, applications, databases, files, folders and singular application objects. Backup Exec 15 brings fast, efficient, and versatile recovery at any scale. What’s New with Symantec Backup Exec 15? 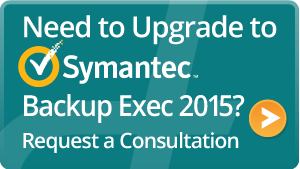 Symantec Back Up Exec is one of the leading backup and recovery solutions available today. In fact, over 2 million customers have chosen Backup Exec to protect their infrastructure – both virtual and physical. “I’ve used other backup solutions in a virtualized environment with varying degrees of success. But for me, the ability to back up a virtual machine image as well as the files inside it – or restore an entire virtualized application or the granular data in it, whether it’s Exchange, SharePoint, or SQL – that’s what makes Backup Exec far more compelling that its competitors.” Paul Flatt, Infastructure & Support Manager, Mitre 10 Limited. Dewpoint is uniquely positioned to provide insights and actionable strategy on bringing the ideal backup and recovery solution for your enterprise. As a trusted Symantec partner, Dewpoint can assist organizations with a full range of Backup Exec upgrade and data protection tasks. Get more detailed information on Symantec Backup Exec and learn how Dewpoint can help your organization today!